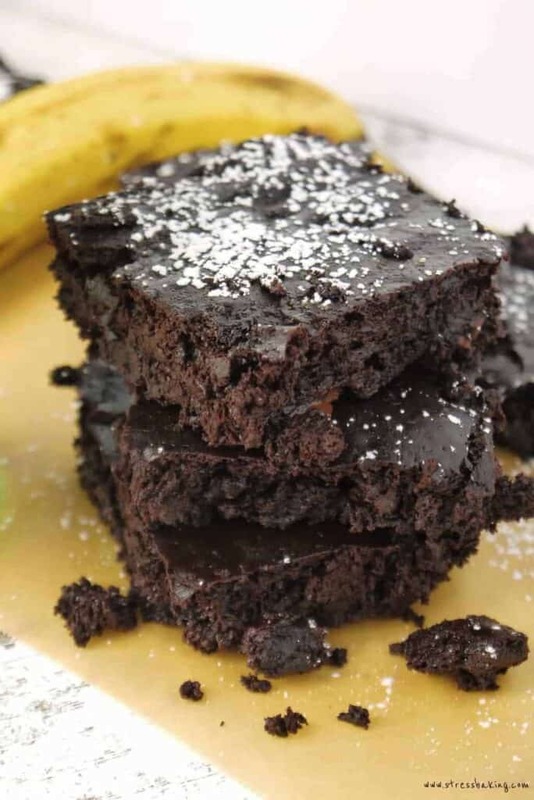 Super fudgy chocolate brownies that you could easily eat for breakfast! This dairy-free, gluten-free and vegan treat will satisfy any chocolate craving without destroying your diet. Let’s talk brownies. 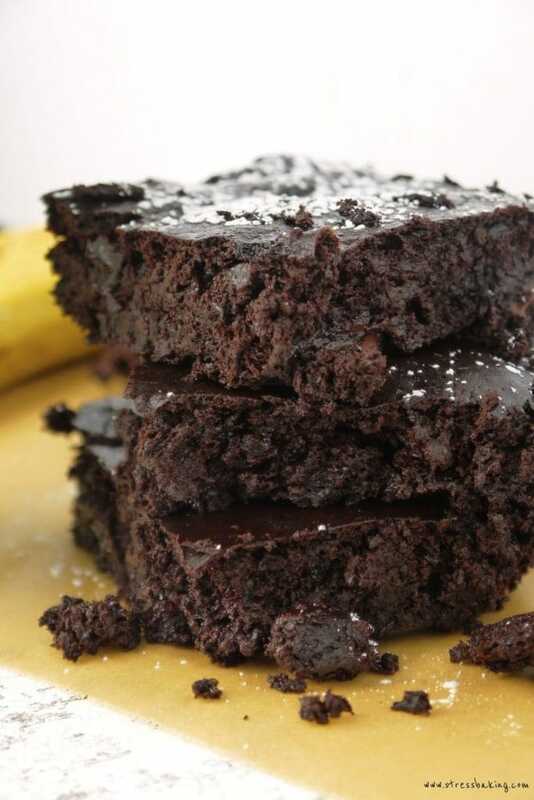 Specifically, these Fudgy Chocolate Banana Brownies. I know, I know – two banana recipes in one week. Clearly I’ve living on the wild side. They’re brownies, sure – but you know what they’re not? Unhealthy. They’re, dare I say, healthy. Good for you. 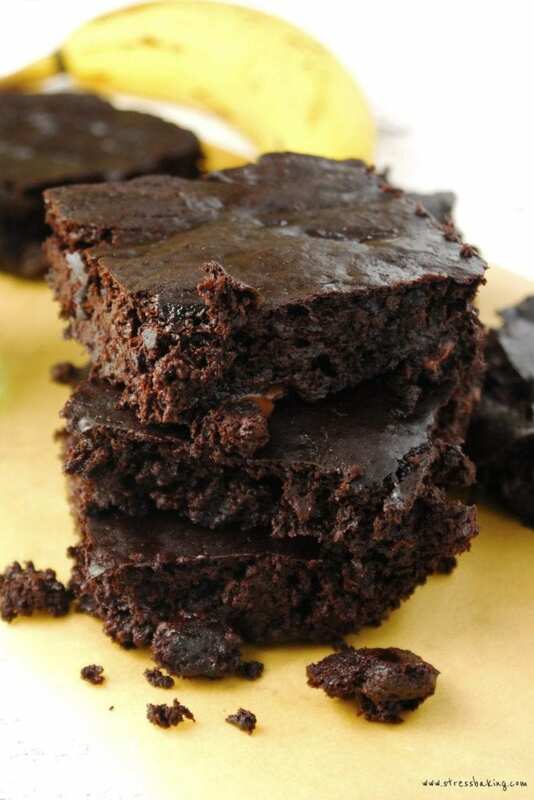 Brownies that are suitable as breakfast. So basically… healthy. Told you! You could easily swap ingredients to your liking and I’ve noted those in the recipe below. This doesn’t HAVE to be dairy-free, gluten-free and vegan – but why not let it be? I mean, c’mon. How could you say no to that? I’ll tell you right now that people in my office were to the point of harassing me for this recipe they loved them so much. And then my coworker’s spouses were harassing me. And I’m fairly confident that a random crow flew by while I was on a walk and asked me about it. 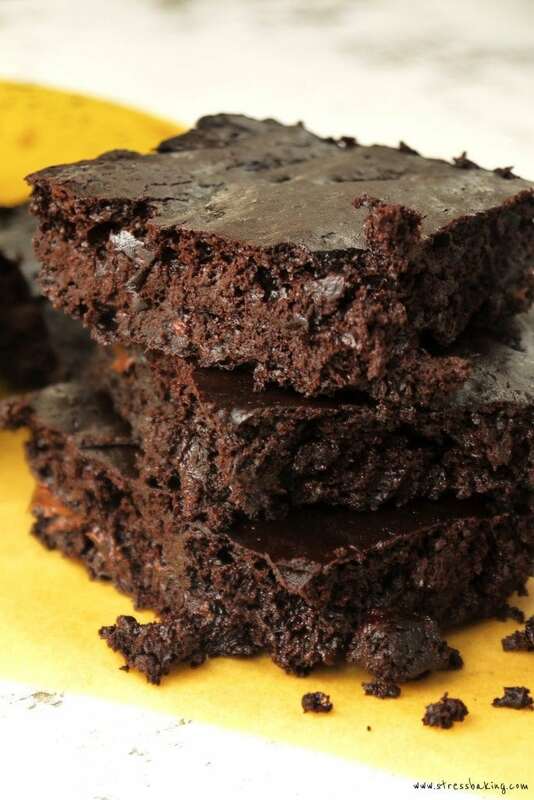 These are so moist that they almost fall apart a little… but in a good way. So keep some napkins and a glass of milk (non-dairy or otherwise) nearby! If you love these as much as I do (and the entire Metrowest Boston area), snap a picture of it and tag #stressbaking on Instagram! Want more bananas, or maybe just more chocolate? Preheat oven to 350°F. Spray an 8×8 pan with nonstick spray and set aside. In a food processor, blend bananas for 5-10 seconds until mostly smooth. Add applesauce, cocoa powder, maple syrup, milk, vanilla and espresso powder and blend until smooth. Add baking soda, baking powder and chocolate chips and pulse for a couple seconds to blend. Pour batter into pan and bake for 25 minutes or until the top is no longer shiny and slightly cracked. The inside should be slightly under-baked – it will set as it cools, and will be the perfect fudgy consistency! Let sit at least a couple hours to cool before cutting and serving (they’ll be even more firm if you can leave them overnight). Store in fridge in an airtight container. Enjoy! These turned out terribly! I baked mine over the over the amount of time because they puffed up then fell flat. They are still gooey, pretty much like the batter was before baking and nothing like your photos! Help??! Any others had success or failure? – maple syrup or honey? – coconut, almond, or a different kind of dairy or non-dairy milk? Thank you for telling me, and I’m going to try to prevent this for others by altering the recipe to the best of my ability! I’m so bummed to hear this! It’s not missing an ingredient, since they’re purposefully without flour. Mine turned out awsome! Great recipe, just curious how many calories do you think 1 square is ? These turned out great! I used an egg and sugar instead of applesauce and honey, and halved the amount of chips. I also mixed everything with a fork instead of blending them. But they still turned out fudgy and moist. I will be making them again. Thanks for the recipe! I promise they will 🙂 I’ve made them many, many times and they always come out as the picture – I would never, ever include photos that isn’t of the recipe that’s noted! That would be cruel and just plain rude to you all. All you have to do is make sure that you’ve let them set for at least a couple hours before you try to cut into them, as noted in the instructions (you can throw them in the fridge if you want to help that process along) and they’ll be fudgy and wonderful! Mine turned out exactly like the images here – I used an egg instead of applesauce and dairy milk (2%). Followed the recipe otherwise. So so good! Well I made them and I did put 2 tbls.flour because I was chicken,And I used the egg and they were the best I had ever had.Pretty much guilt free with almost no flour and no sugar. Haha, I understand why you may have been worried – I’m glad you liked them! This recipe is awesome! I am a vegan so I experimented with vegan egg (flaxseeds+hot water) instead! Cheated without putting baking powder, vanilla and coffee and it turned out perfectly fine after I left it in the fridge overnight! May I know what is the size of the cup you used for the cocoa powder? I’m so glad you liked it! However I’m not sure what you mean by your question – I used 1 cup (aka: 8 ounces) cocoa powder. I hope that answers your question! I substituted an egg, dairy milk, 1/2 cup sucralose, and 1/4 cup mini chocolate chips and they turned out well. I think they need whipped cream or ice cream to make them really tasty, but that’s probably because they have so much less sugar with so few chocolate chips. This way they are only 2 weight watcher points for 1/9 of the recipe. I made a few changes And they turned out more cakey than fudgy (actually how I like it), and my family loved them! I made only 8 though. I first used an egg, then I only added a 1/2 cup of cocoa and 1/2 cup of all purpose flour. (Maybe you can use gluten free flour??). I skipped the espresso powder, substituted the maple syrup with 8 drops of stevia (stevia is a natural sweetener), and added one extra tablespoon of almond milk. I baked on a lower temperature (300 Fahrenheit) for about the same time. 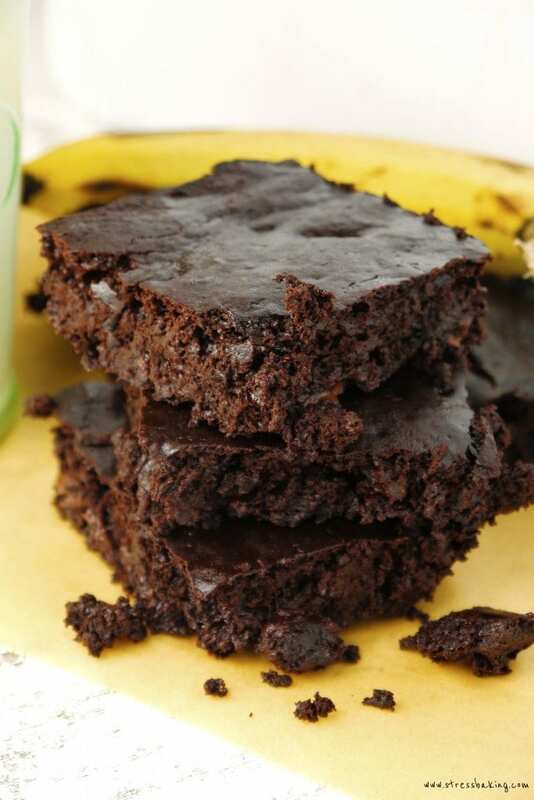 This recipe is great to use up bananas and make yourself a treat! These are revolting. You have no flour in the recipe at all so it is just straight cocoa powder. Its way too strong of a taste and they fall apart when you cut them bc there is nothing holding it together! Wow, that’s a very strong reaction! I always hate to hear someone having a negative experience with one of my recipes – but it sounds like maybe you didn’t let it set completely, as noted in the recipe. You most definitely have to let them set for at least a couple hours before you try to cut into them and you can throw them in the fridge if you want to help that process along more quickly. At that point they’ll be very moist and fudgy, but shouldn’t completely fall apart. 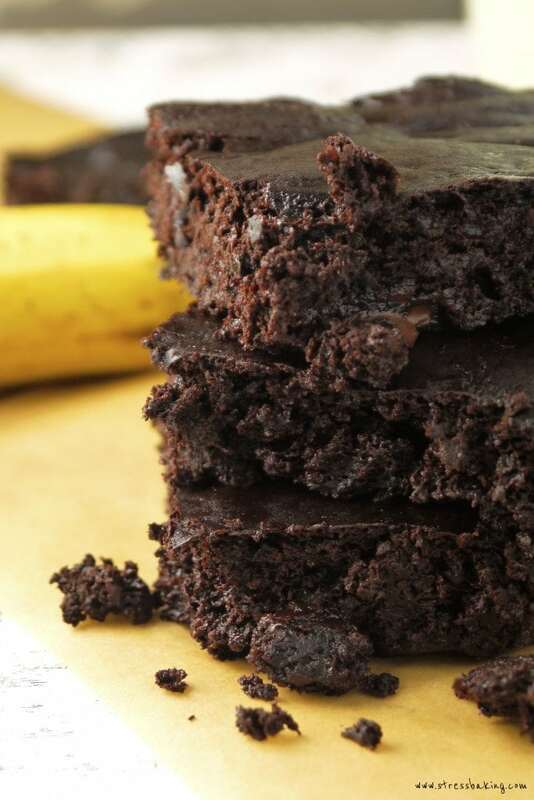 They do have a strong chocolate and banana flavor, so if you’re not into either of those this recipe definitely wouldn’t be appealing to you. I’m sorry you didn’t enjoy these, but hope you’ll try other non-chocolate/banana recipes on my site to find something more to your tastes! 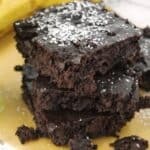 I love these healthy fudgy brownies and share with my healthy and celiac friends. I think the size pan you recommended may be too small, with the exception of the version of the recipe that includes the egg. I used maple syrup, applesauce and coconut milk and the result had edges that had a consistency as shown in the picture of the finished recipe above, but the inside shifts around and is liquidy like batter. Also, I followed the recipe exactly and my brownies are far thicker than yours. That makes me so happy to hear – thank you so much for stopping by to comment! I used Premier Protein powder instead of the cocoa powder and these turned out sooo good! Thanks for the recipe! That sounds great – so glad you liked it. Thanks for stopping by to share!